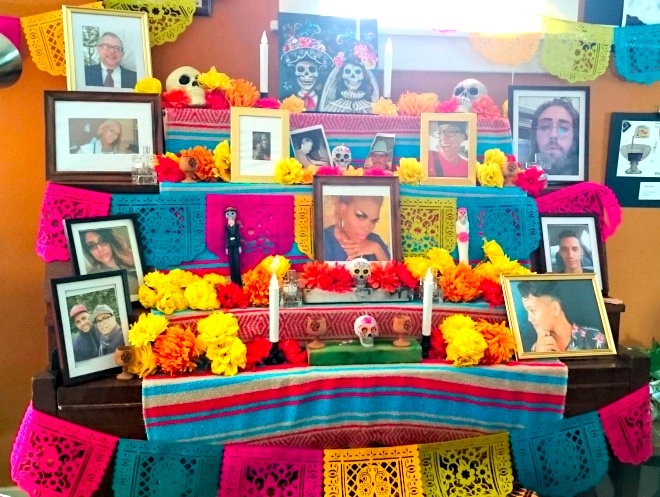 Thank you to everyone who celebrated Dia de los Muertos (Day of the Dead) with us! The pictures, letters, and offerings helped to turn this event into an opportunity for community healing. While the altar has come down, we have been invited to build an altar at the Memphis Day of the Dead celebration. We would like to invite everyone to participate in the Memphis Day of The Dead event at El Mercaditos this Sunday, Nov. 4th at 3766 Ridgeway Rd. Memphis, TN 38115 from 1pm-7pm. We will bring all of the images from our OUTMemphis altar to the event, but please feel free bring pictures of your own as well. For those who would like to help in setting up the alter for OUTMemphis, we will start at 10am on Sunday Nov. 4th inside El Mercadito. For more information please contact Jessie Claudio, Men’s Sexual Health Specialist. The event itself will run from 1pm until 7pm, and there will be art exhibition, community altars, face painting, food, local bands, mariachi, and much more! For more information visit the Memphis Day of the Dead facebook event. OUTMemphis te invita que participes para el evento del Mercadito “Memphis Day of The Dead” que va ser este domingo, 4 de noviembre en EL Mercadito: 3766 Ridgeway Rd. Memphis, TN 38115 desde las 1pm-7pm. Si te gustaría ayudarnos a decorar el alter de OUTMemphis, comenzaremos domingo noviembre 4 a las 10 am. Para mas información por favor contacta Jessie Claudio. El evento oficial comenzara desde las 1pm-7pm, tendrán exhibición de arte, calvaritos, grupos folclóricos, alteres comunitarios, comida, danzas aztecas, grupos musicales, y mucho mas! Para mas información visita la pagina en Face Book.